Peek Frean pioneered the modern British biscuit, and invented the Bourbon, Custard Cream and Garibaldi varieties. James Peek (1800 – 1879) was a wealthy tea merchant from Devon. He was from a nonconformist religious background. Peek established a biscuit factory at Mill Street, Dockhead in Bermondsey in 1857. George Hender Frean (1824 – 1903), a relation by marriage, was invited to become managing partner. Frean was a Baptist from Plymouth who traded as a miller. Initially there were eight employees. The firm acquired a licence from Dr John Dauglish (1824 – 1866), the inventor of bread aerated without yeast, to manufacture his product from 1858. Aerated bread could be produced more quickly than regular bread, and was believed to be more hygienic. The aerated bread and biscuit factory employed nearly 200 men by 1859. Peek Frean introduced the Garibaldi biscuit in 1861. However the biscuit which made the firm’s reputation was the Pearl, introduced in 1865. Small, round and sweet, it was softer than any previously mass produced British biscuit. It dispensed with the “docker holes” used to prevent biscuits rising in the oven, and was the pioneer of the modern biscuit. James Peek divested his stake to his son-in-law, Thomas Stone (1827 – 1893), a silk manufacturer, in 1866. A new factory was opened on Drummond Road, Bermondsey in 1867. The French government placed an order for 460 tons of biscuits in 1871. The Marie biscuit was introduced in 1875. Arthur Carr (1855 – 1947) joined Peek Frean as an apprentice in 1872. A Quaker, Carr was a member of the biscuit-making family of Carlisle. A fire destroyed the Dockhead premises in 1876. Arthur Carr was made partner from 1877. Peek Frean became the first business in London to be supplied with electricity from 1880. After much quarrelling with Stone, Frean entered retirement in 1887. Stone was joined in partnership by his two sons, Huntington (1857 – 1916) and Ralph Erskine Stone (1861 – 1897). Peek Frean workers joined the London Dock strike in 1889. Depots were established across Britain from around 1890. Thomas Stone died in 1893 with a personal estate valued at £340,000. R S Stone died in 1897 with an estate valued at £228,944. The firm introduced the first chocolate coated biscuit in 1899; the Chocolate Table biscuit was a precursor of the Chocolate Finger. By 1899 the partners were John Carr (died 1924), Ellis Carr (died 1930), Arthur Carr and Huntington Stone. Profits for the year were £47,619. The firm had a Royal Warrant to supply biscuits to the Prince of Wales by 1900. The firm became a limited company, Peek Frean & Co Ltd, in 1901 with a share capital of £500,000. The firm sold through 45,000 outlets. The shortbread-based Pat-A-Cake biscuit was launched in 1902. The first biscuit marketed at an affordable price, it was to prove a major success for the company. First week sales totalled over twelve tons. Nearly 400 million Pat-a-cake biscuits weighing a total of 6.5 million lbs were sold in 1906. Annual sales for this single type of biscuit amounted to £160,000. As well as the Pat-a-cake, 250 different varieties of biscuit were sold. Arthur Carr became chairman and managing director of Peek Frean from 1904. Carr massively increased the company’s advertising budget. The company employed 1,200 to 1,300 men, 900 to 1,000 girls, and 250 office staff by 1907. Production of the Pearl biscuit ended in 1907. The Bourbon, a cocoa-flavoured cream sandwich biscuit, was introduced in 1910. Peek Frean’s Family Circle biscuit assortment. The box likely dates from the 1980s. Peek Frean was an enlightened employer for the period. Staff received in-house medical and dentistry care (to which the company paid £3,000 a year in 1911), and a staff canteen which the company subsidised to the level of hundreds of pounds a year. By 1911 a third of company profits were spent on employee welfare, and wages were among the highest in London. A Bermondsey carman’s strike closed down the Peek Frean factory in 1911. 2,500 employees were temporarily thrown out of work. A Bermondsey women’s strike in August 1911 saw 1,200 employees refuse to work. The strikers wanted higher pay and the abolition of short shifts. However Peek Frean management countered that strikers had intimidated non-striking staff and that their wages were higher than the Bermondsey average. Peek Frean produced nearly 100 million shortbread biscuits in just three months in 1912. This was understood to constitute a record for the sale of biscuits. Peek Frean established the Meltis chocolate factory in Bedford in 1913. 130 people were employed there. Peek Frean introduced the Custard Cream biscuit in 1913. Between 1900 and 1913, sales doubled and profits almost quadrupled. Huntington Stone died in 1916 and left a gross estate valued at £239,580. He bequeathed around £200,000 to Christian missionary charities. In 1920 Peek Frean claimed that Pat-A-Cake was the most popular biscuit ever produced. High income tax and death duties convinced Huntley & Palmer of Reading to accept Peek Frean’s invitation to merge in 1921. A holding company, Associated Biscuit Manufacturers, with a capital of £2.5 million, was formed. John Carr died in 1924 and left an estate valued at £152,859. Peek Frean acquired Britannia Biscuits of India, with a factory in Mumbai, in 1924. Peek Frean had introduced Vita-Wheat, the first British wheat crispbread, by 1927. Twiglets, the savoury snack, were introduced in 1930. Ellis Carr left a personal estate of over £1 million in 1930. Peek Frean acquired the English subsidiary of Suchards of Switzerland, based at Bedford, in 1932. Peek Frean had established an Australian subsidiary by 1934. The Peek Frean site covered twelve acres by 1939. Over 300 different varieties of biscuit were produced. The company manufactured its own biscuit tins; some three million a year. Arthur Carr died in 1947 with an estate valued at £630,206. Peek Frean established a factory in Ontario, Canada in 1948. The site covered seven acres. The Bermondsey factory employed 3,700 people by 1954. Peek Frean acquired the Ashley Vale Biscuit Company Ltd, with a factory at Avonmouth, Bristol in 1955. There were 1,750 employees at Bermondsey in 1964. Peek Frean closed the factory in Bristol in 1965 and relocated production to Bermondsey. 350 to 400 employees were made redundant. The Meltis confectionery site at Bedford employed 1,300 people by 1966. The factory had extended to cover five acres, and Meltis was the largest producer of Turkish Delight in Britain, and the second largest producer of liqueur chocolates. Meltis merged with Chocolat Tobler to form Tobler Meltis in 1967. Interfood, the owner of Suchard, acquired Tobler Meltis in 1975. The loss-making Peek Frean (Australia) was sold to Arnotts, the leading biscuit manufacturer in that market, in 1975. Nabisco of America acquired Associated Biscuits for £84 million in 1982. Peek Frean was the largest manufacturer of Christmas puddings in Britain by 1984. This was due to the fact that they were relatively low-priced, as they did not contain alcohol. The Peek Frean brand had become primarily associated with commodity and children’s biscuits by the mid-1980s. The Bermondsey factory was closed with the loss of 1,022 jobs in 1989. The factory had high overheads due to its inner-city location and age, and was operating at just 50 percent capacity. Meanwhile, the biscuit market had been in decline. Production was transferred to Aintree and Leicestershire. The India and Pakistan subsidiaries were divested for $44 million in 1989. Britannia was the largest biscuit manufacturer in India, and English Biscuit Manufacturers was the largest biscuit manufacturer in Pakistan. All advertising support for Peek Frean branded products in the UK ended from 1990. Although no longer in use in Britain, Peek Frean branded products continue to be manufactured in Canada and Pakistan. 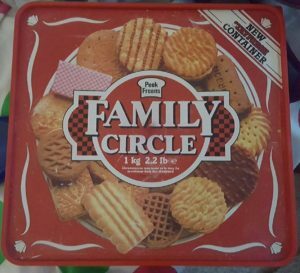 The Peek Frean Family Circle biscuit assortment is still sold. It was initially rebranded as Crawford’s, and latterly as McVitie’s. A descendant of the Peek family acquired the European rights to the brand in 2017.